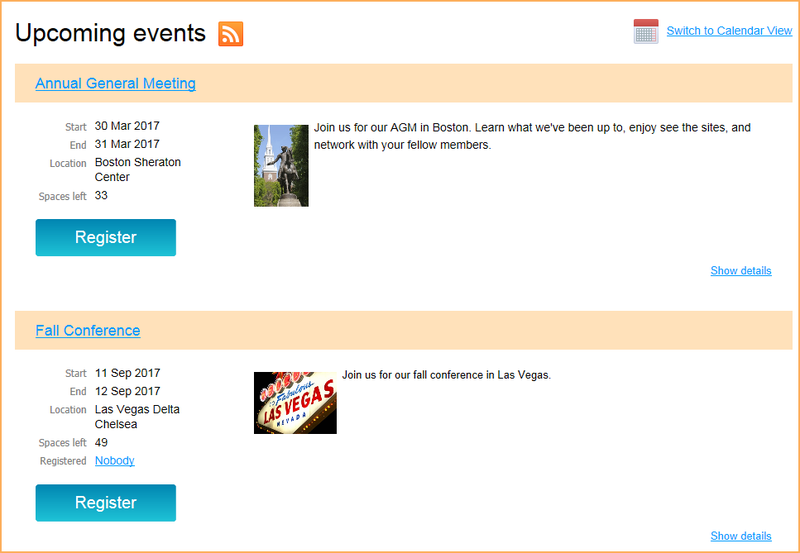 Once an event is set up and online registration is enabled, it will appear on your event calendar page in Wild Apricot, where your visitors to your site can view details and register for the event – from their computer or mobile device. Online registration will be disabled once the event date has passed. However, administrators can manually register attendees after the event has taken place. One person can register and pay for multiple attendees. To do so, return to the event registration page after confirming each registration but before paying. Whether a visitor can register multiple times under their own email address depends on the Disable multiple registrations for the same contact option that appears for each event on the Registration types & settings tab. First, they will be asked to enter their email address. If they are already logged in, their email will already be filled in (though they can change it, to register another person). If there are multiple registration types, they will then be asked to select a registration type. Depending on whether they are logged on or not, some member-only registration types may not be available. If they are not logged in, but their email is stored in your contact database, they will be prompted to log in. If their email is not stored in your contact database, they will be prompted to apply for membership. If the event registration was set up with restrictions and is not thereby available to the registrant, Wild Apricot will display a message that registration is not available. Once they select a registration type and click Next, the main registration form appears. Here, they fill out the registration form, and select additional event options, if any (e.g. meal preference, event sessions). If the event is set up with a guest registration option, the registrant will be able to add or indicate the number of guests. Once they complete the form and click Next, the event record is created. If only offline payment was enabled, then the registrant will have the option of cancelling or confirming the registration. If the registrant clicks the Confirm button, an invoice will be emailed to them, and a registration summary will be displayed. From the registration summary, the registrant can choose to view or pay the outstanding invoice. If only online payment is enabled, then a Pay online button will appear. Clicking the Pay online button will take the registrant to the online payment screen for your site's payment provider. If both online and offline payment is enabled, then two buttons will be displayed: Pay online and Invoice me. Clicking the Pay online button will take the registrant to the online payment screen for your payment provider. Clicking the Invoice me button will result in the registrant being emailed an invoice – which they can pay online or offline – and a registration summary being displayed. From the registration summary, the registrant can choose to view or pay (online) the outstanding invoice. When someone who is not in your database registers for an event, they are added as a contact to your database, and an email will be automatically sent to them with their password and other login information. If they then apply for membership, they will be prompted to log in before processing with the application process. 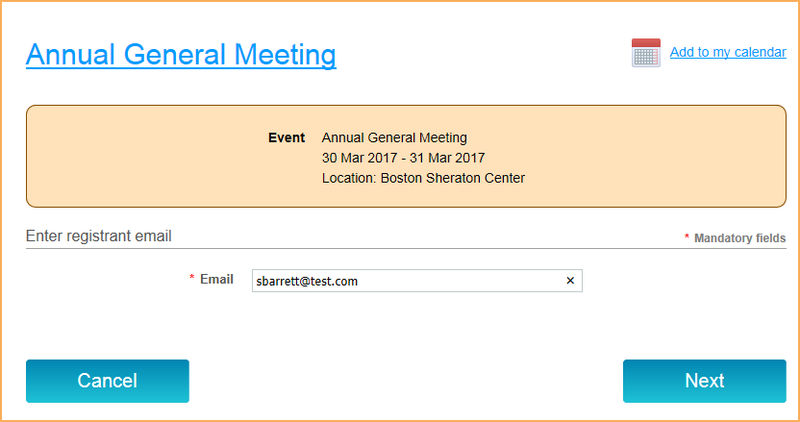 Whether guests are automatically added to your contact database depends on the Guest registration setting that appears within the event details for each event. After registering for events, registrants can view their event registrations from the My registrations tab on their member profile. Depending on how you have set up your registration types, registrants may be allowed to cancel their event registrants by clicking on the registration within the list then clicking the Cancel registration button from the registration details.